Description Product Specification Warranty: 1 Year Certificate: ROHS FCC CE Certification Condition: New Product Type: Replacement AC Adapter Input voltage: 100-240V ~ 1.5A, 50 - 60Hz Output voltage: 20V 3.25A, 65Wat Size of Connector: 5.5x2.5mm Buying the right adapter Tips . Specification: Brand: Sunydeal Input voltage: 100-240V ~ 1.5A, 50 - 60Hz ​Output Power: 65W Output:19.5V, 3.33A Size of Connector: 4.5*3.0mm (Blue Tip With Pin Inside) Condition: New Product Type: Replacement AC Adapter Certified to CE& FCC Standards, RoHS compliant. 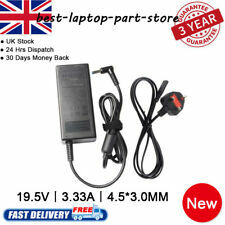 High quality generic replacement laptop charger. 100% compatibility with the original. Tips for how to choose the right charger/adapter for your laptop: 1. Please make sure the DC Output& Connector Size are matching your original Adapter before you buy. 2. Output Voltage and polarity must match with your old adapter. 1 X AC Adapter. 1 X Power Cord. Includes power cable. MPNDoes Not Apply. Features: 【Quick Charge 3.0 & Power Delivery 3.0】 This Wall Charger charges 75% faster than standard chargers, 45W compatible with all versions of Quick Charge Technology (1.0, 2.0 & 3.0) and Power Delivery（1.0， 2.0 & 3.0）, Also compatible with USB-C devices (Which support PD Function) and can provide standard charging for non-fast devices. 【Fast Charging】 This QC 3.0 & PD 3.0 Charger can charge fast with Iphone 8/8 plus/X/XS, 12.9-inch iPad Pro, 10.5-inch iPad Pro, 12-inch Macbook, Macbook pro, DELL, HP Spectre, Lenovo ThinkPad, HP BLADE STEALTH 12.5 etc. 【Security Protection】. 1 X AC Adapter. Compatible Product LineFor HP Pavilion. Includes power cable. 1 X Power Cord. Check AC adapter connector shape thoroughly. If laptop needs 3.42a, then 4.7a is OK – the laptop will take 3.42a as needed. Size of Connector: 5.5x2.5mm. Compatible List: (The adapter is suitable for but not limited to these models. ). 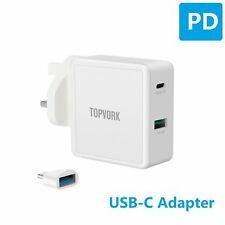 Topvork PD/QC 3.0 Fast USB C Charger quick charge your 12.9-inch iPad Pro ,10.5-inch iPad Pro；12-inch Macbook、DELL XPS 12-9250、DELL XPS 13-9350、DELL Latitude 7275 、DELL InSpiron 13 7378 2-in-1；.New 45w usb c power adapter quick charge save more time for you in the office, or on the go with the new 45w Laptop usb c wall Chareger. 45W Power Output, Compatible with More Devices Laptops: MacBook Pro13”/ 15”, MacBook 2015/ 2016/ 2017, XiaoMi Notebook Air/ Pro, DELL XPS 12/ 13, Google Chromebook Pixel, Lenovo ThinkPad X1 Carbon 2017, ThinkPad X270, Razer Blade Stealth, HP Spectre X360, Samsung Chromebook Plus etc.. 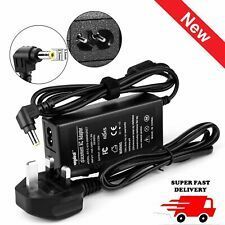 Specifications: Input Voltage: 100-240V, 50-60HZ Output Voltage: 18.5v ~ 2.7A/3.5A/3.8A, 65W Size of Connector: 7.4 x 5.0mm Product Type: Replacement AC Adapter Condition: New Buying tips for charger: 1. Please make sure the DC Output& Connector Size are matching your original Adapter before you buy. 2. Output Voltage and polarity must match with your old adapter. 3. Output Current is not as critical as output voltage, you could select either same or higher output current adapter..
1 X AC Adapter. Such as battery, ac adapter etc. All item passed FCC / CE / ROHS certificates. Includes power cable. 1 X Power Cord(Plug). We will very appreciated for your doing. We work with a good quality supplier and factory. Description Product Specification Warranty: 1 Year Certificate: ROHS FCC CE Certification Condition: New Product Type: Replacement AC Adapter Input voltage: 100-240V ~ 1.5A, 50 - 60Hz Output voltage: 20V 3.25A, 65Wat Size of Connector: 5.5x2.5mm Buying the right adapter Tips：. Will send second class sign for. Description * INPUT : 100 - 240V 50 - 60HZ * OUTPUT : 19V-- 3.42A 65W Max * DC connector : 5.5 x 2.5mm Black * Dimension : 135*55*30 mm Compatible with:. DC Output: 19V 4.74A. Plug Type: 3pin (UK). 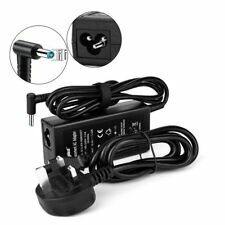 Description Product Specification Warranty: 1 Year Certificate: ROHS FCC CE Certification Condition: New Product Type: Replacement AC Adapter Input voltage: 100-240V ~ 1.5A, 50 - 60Hz Output voltage: 20V 3.25A, 65Wat Size of Connector: 5.5x2.5mm Package Included: 1 x AC Adapter 1x Free UK Fuse Power cord Buying the right adapter Tips：. 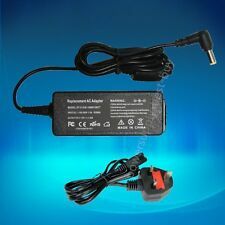 Product Specification: Warranty: 1 Year Certificate: ROHS FCC CE Certification Condition: New Product Type: Replacement AC Adapter Input voltage: 100-240V ~ 1.5A, 50 - 60Hz Output voltage: 19.5V 3.34, 65Wat Size of Connector: 7.4 x 5.0mm (This is a Round Shaped Connector) Tips to Buy a right adapter: * If the specifications are the same as your original one, this one should be fit. * Please check volt/p of your original adapter. (Voltage deviation should be no more than 5%. For example, required voltage is 19v, 18.05v to 19.95v will do the job.). Topvork PD/QC 3.0 Fast USB C Charger quick charge your notebook pro 13,15 inch ,2017 Microsoft Surface Book 2 & HP Spectre x360 13-w021TU 13.3".New 87w usb c power adapter quick charge save more time for you in the office, or on the go with the new 87w Laptop usb c wall Chareger. .
Topvork PD/QC 3.0 Fast USB C Charger quick charge your notebook pro 13,15 inch ,2017 Microsoft Surface Book 2 & HP Spectre x360 13-w021TU 13.3".New 45w usb c power adapter quick charge save more time for you in the office, or on the go with the new 45w Laptop usb c wall Chareger. 45W Power Output, Compatible with More Devices Laptops: MacBook Pro13”/ 15”, MacBook 2015/ 2016/ 2017, XiaoMi Notebook Air/ Pro, DELL XPS 12/ 13, Google Chromebook Pixel, Lenovo ThinkPad X1 Carbon 2017, ThinkPad X270, Razer Blade Stealth, HP Spectre X360, Samsung Chromebook Plus etc..
POWER CORD is included where applicable. AC Input: 100~240V / 50-60HZ. Warranty: 1 Year. Connector Size: 7.4 x 5.0mm. DC Output: 18.5V 3.5A. Power: 90W. DC Output: 19V 4.74A. Why Buy From Us?. Specifications: * INPUT : 100 - 240V 50 - 60HZ * OUTPUT : 19V-- 3.42A 65W Max * DC connector : 5.5 x 2.5mm Black * Dimension : 135*55*30 mm Compatible List: Compatible with: . Specification: Input voltage: 100-240V ~ 1.5A, 50 - 60Hz Output voltage: 19v ~ 3.95A /4.22A /4.74A /4.9A 90Wat Size of Connector: 5.5 x 2.5 mm Condition: New Product Type:Replacement AC Adapter Tips for how to choose the right charger/adapter for your laptop: 1. Please make sure the DC Output& Connector Size are matching your original Adapter before you buy. 2. Output Voltage and polarity must match with your old adapter. 3. Output Current is not as critical as output voltage, you could select either same or higher output current adapter. Power: 65W. POWER CORD is included where applicable. DC Output: 18.5V 3.5A. AC Input: 100~240V / 50-60HZ. Plug Type: 3pin (UK). Quantity: 1 piece. Warranty: 1 Year. AC Input: 100~240V / 50-60HZ. Dell Inspiron PP29L PP12L N7010 N5050 N5040 N5030D N5030 N5010 M301z M301 M1530 M1340 M1318 M101z IM4110 E1705 E1505 E1c 710m 700m 640m 630m 610m 600m 6000D 510m 505m 500m 300m 13z 13r 1320n 11Z-1121 11z 6 9 9 5 2 1 1 1 1 1 1 1 1 1 1110 17 15 14 13 11. This item is in very good condition although the item is USED. Sony ac-m1215ww 12v WITH POWER LEAD. Aspire 2021 Aspire 2021WLMi Aspire 2022 Aspire 2023 Aspire 2023LMi Aspire 2023WLCi Aspire 2023WLMi Aspire 2024 Aspire 2024WLCi. Aspire 2024WLMi Aspire 2025 Aspire 2025LMi Aspire 2025WLMi Aspire 2026 Aspire 2026LMi Aspire 2026WLMi. Output Power: 65W. Size of Connector: 4.5 3.0mm (Blue Tip With Pin Inside ). 15-n018tx HP 15-R011dx HP 15-r015dx HP 15-r017dx HP 15-R018dx. 100% compatibility with the original. HP 14-Q series. HP 14-N series. 1 X AC Adapter. Includes power cable. HP Pavilion G4 G6 G7 G42 G56 -130SA G60 G72. HP Pavilion DV 4DV5DV6DV7. Compatible Laptop Part Number HP Compaq 6710b 6735s 6910 nc6400 nx6110. HP EliteBook 2530p 2540P 8440p 8540w 8740w. HP Envy17 17-1000. Specifications: Input voltage: 100-240V ~ 1.5A, 50 - 60Hz Output voltage: 19V ~ 3.42A, 65Watt Size of Connector: 5.5x1.7mm If these three specifications are the same as your adapter, you can be sure our adapter is compatible, even if your model is not listed. *Output current on adapter can be same or higher than laptop requirement* Compatible List: .